The Sioux County Soil and Water Conservation District has been selling deciduous trees and shrubs and potted evergreens trees since 1992. Our nursery stock comes from Schumacher’s Nursery and Berry Farm in Heron Lake, Minnesota. Anyone can order trees. 2019 Tree Pick Up date is Tuesday, April 9, 2019, from 12:00 noon to 3:00 P.M. Customer pickup is in a NEW LOCATION IN 2019. Please turn west at the corner of 9th Street NW & Highway 75 in Sioux Center. We will be in the building one-half block west of NAPA and north of Central Vet Clinic in Sioux Center. NOW TAKING ORDERS FOR 2019. CLICK ON TREE PRICE LIST ABOVE AND PRINT. YOU CAN SEND YOUR ORDER BLANK TO THE OFFICE, CALL IN YOUR ORDER, OR EMAIL YOUR ORDER BLANK TO THE EMAIL ADDRESS ON THE ORDER BLANK. Sioux County SWCD owns a tree planter. The tree planter is transported on a trailer which can be pulled with any size pickup. The person renting the tree planter provides their own tractor and person to operate the tree planter. 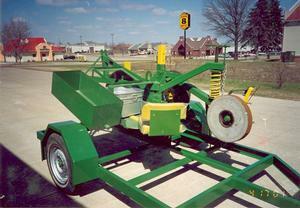 The tree planter has a 3-point hitch and can be pulled with a small tractor when planting. The tree planter works well with deciduous stock, but is not recommended for planting evergreen stock. The cost to rent the tree planter is $25 for one-half day and $50 for a full day.